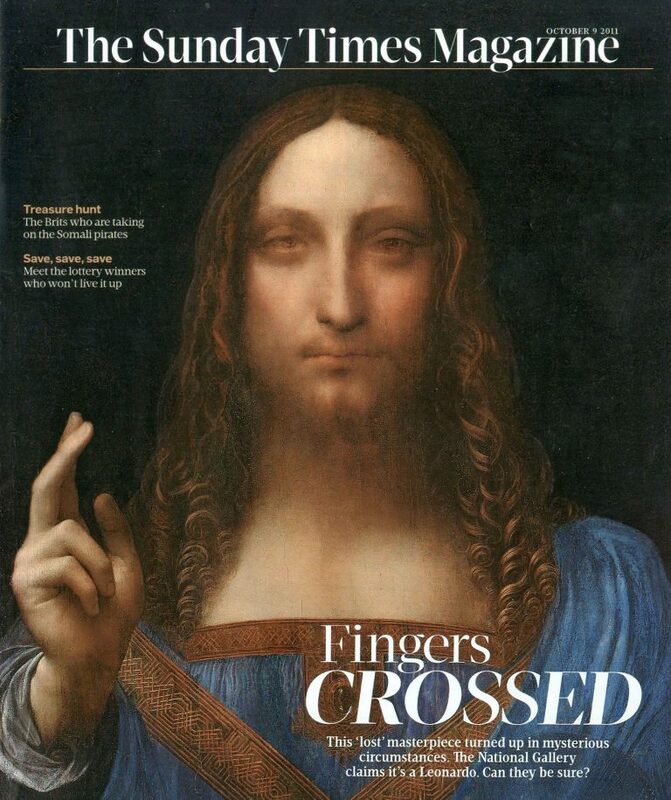 Mounting concerns over transparency in art world deals are throwing back-dated light on the Salvator Mundi’s reception in its first-restored incarnation when included in the 2011 National Gallery exhibition Leonardo da Vinci: Painter at the Court of Milan. Above, top, the Sunday Times magazine cover of 9 October 2011. 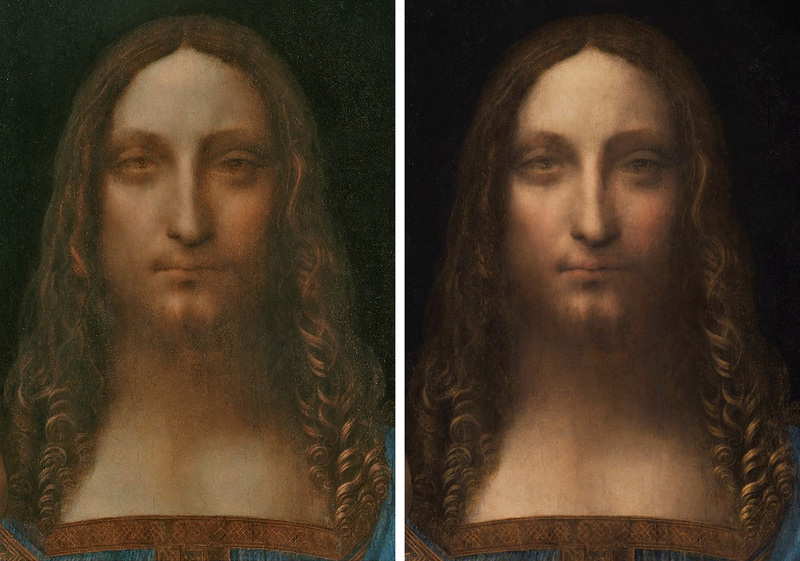 Above, the face of Christ in the Salvator Mundi as seen after repainting in 2011, left; above, right, the face of Christ in the Salvator Mundi as seen in November 2017 after further repainting between 2012 and 2017. Above, and top left, the Salvator Mundi as exhibited in 2011 at the National Gallery’s big Leonardo exhibition. In the event the picture was sold privately by Sotheby’s in 2013 to a Swiss businessman, Yves Bouvier, who is known as the “Freeport King” (and who, among many commercial interests, owns an art conservation and authentication service), for appreciably less than the sums of $150-200m being talked about in 2011 (when the owners reportedly had turned down a $100m offer). The original consortium and Robert Simon received $80m for the Salvator Mundi from Bouvier who resold it for $127.5m to the Russian billionaire Dmitry Rybolovlev. 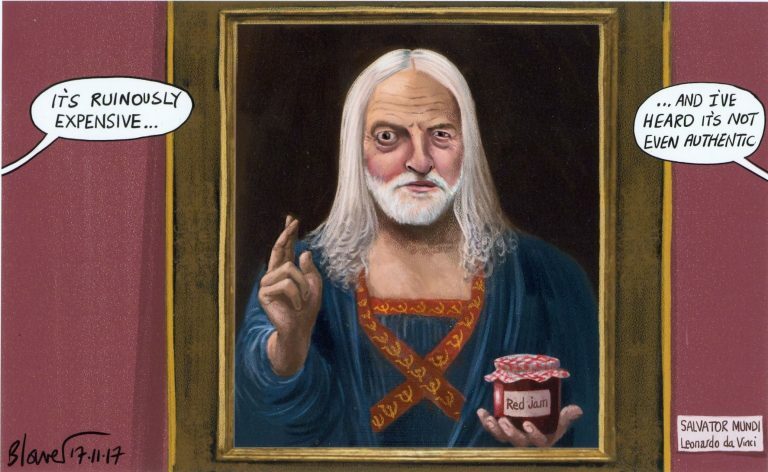 To this day we do not know who owned the Salvator Mundi before 2005 or between 2005 and 2013. From whomever and by whomever it was bought in 2005, the painting’s reception as an attributed Leonardo in 2011 was very far from uniformly rapturous. In addition to the dissenting scholars we cited on 14 November 2017 (see THE CRITICAL RECEPTION OF THE NEW YORK SALVATOR MUNDI), a number of newspaper art critics were un-persuaded. “…The picture is certainly Leonardesque. But is it by Leonardo? That is the considerably-more-than-million-dollar question for the consortium of art dealers who acquired the work a few years ago for an undisclosed sum. If the attribution holds up they can expect to reap £125m as a reward for their good judgement. “Leonardo da Vinci: Painter at the Court of Milan is a breathtaking and truly remarkable exhibition which brings together around half of the surviving 15 or so surviving paintings by the famously dilatory artist of the Italian Renaissance…Two works in particular appear destined to come under scholarly fire. 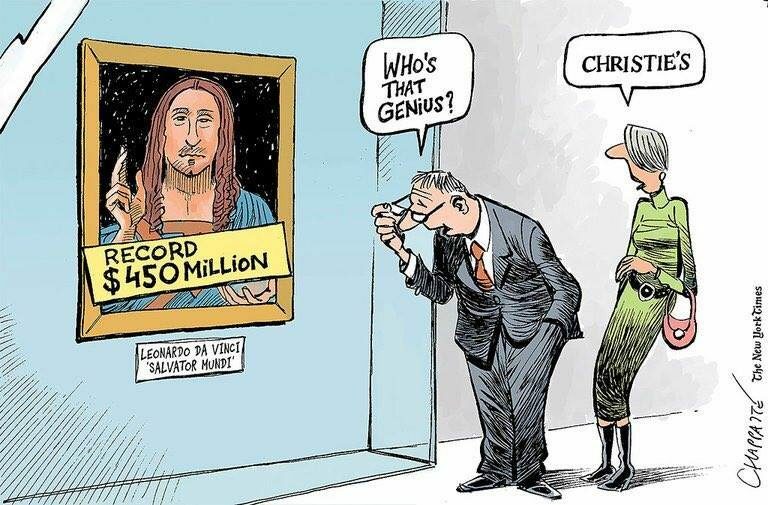 “Although it gets the thumbs up from the National Gallery’s curator, [Luke] Syson, there will certainly be those who question the new Christ. The picture undeniably displays a number of the painter’s characteristic devices and mannerisms, but there are other aspects of it that seem foreign to Leonardo himself. “The next time I saw the painting was in 2011 when the big Leonardo exhibition was opened in London. Full of magnificent loans – the Lady With an Ermine, from Poland; the Virgin of the Rocks from the Louvre – it really was a once-in-a-lifetime event. And there on the wall was the recently rediscovered Salvator Mundi looking just as strange and sci-fi as I remembered it. “Soon after its London unveiling it was sold on to the Russian Billionaire, Dmitry Rybolovlev, for a reputed £98m. It was Rybolovlev who sold it again in New York last week. “How did Leonardo’s sci-fi Christ, who looks as if he belongs on the cover on one of L Ron Hubbard’s scientology textbooks, end up costing all those shekels? It was mostly due to the wicked brilliance of Christie’s. “Not only did the auction house tour the picture noisily to Hong Kong, and London before the New York sale, drumming up interest among the newly rich, but its hype department was also in full swing on this one. Finding a new Leonardo, boomed Gouzer, ‘is rarer than finding a new planet’. It’s ‘the greatest discovery of the century’ repeated the Christie’s chorus. “In recent years modern art has been where the money goes. A new generation of mega-rich collectors who know a lot about luxury brands but not much about art, have piled into the market and sent prices soaring. “Earlier this year a quickly splattered Jean-Michel Basquiat of a face shaped like a skull sold in New York for an astonishing £85m. By putting the Leonardo in such a context, Christie’s circumnavigated the knowledgeable world of the Old Master collector and headed straight for the dumb f**** with the money. “There are various ways to understand events in New York on Wednesday night [of 15 November 2017]. It so happens that the scholar who first attributed the Salvator Mundi to Leonardo, Professor Mina Gregori, was also the first scholar to attribute the proposed Leonardo drawing that was dubbed “La Bella Principessa” by Professor Martin Kemp. However, “La Bella Principessa” was not included in the National Gallery’s Leonardo exhibition and, seven years later, it remains unsold. 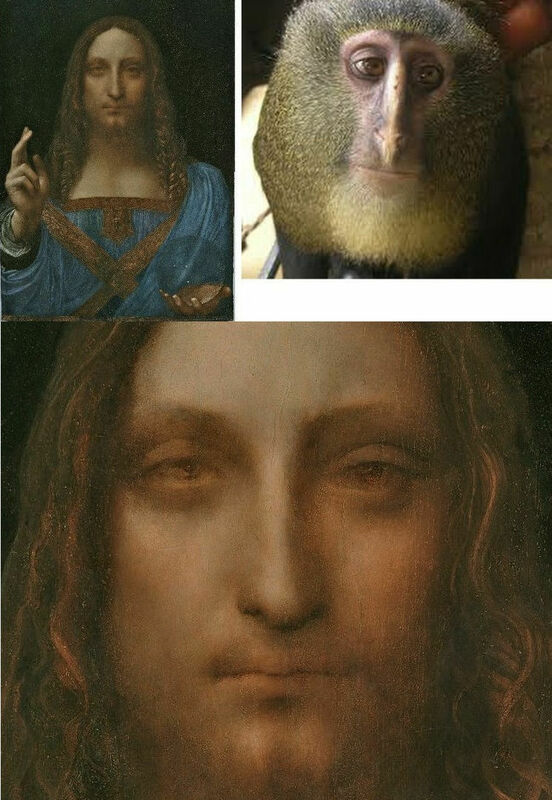 Although we know precisely why the dissenting scholars rejected the Salvator Mundi attribution (- they published their views in the scholarly press), we have virtually no information of who said what and in what order among the consensus of scholars listed by Christie’s (see Problems with the New York Leonardo Salvator Mundi Part I: Provenance and Presentation). “Potential shenanigans involving art are in the spotlight once again. London art dealer Matthew Green is among defendants in the case against Beaufort Securities, three other corporations and five other individuals, accused by the US Department of Justice of a multiyear $50m-plus securities fraud and scheme to launder money, partly through the sale of a £6.7m painting by Picasso. “The indictment alleges that Green, described as the owner of Mayfair Fine Art Limited, met last month with an investment manager from Beaufort Securities (now declared insolvent), as well as a property developer and an undercover federal agent masquerading as a client of the brokerage firm. At this meeting held around February 5, the court papers say that the agent-client was told he could ‘purchase a painting from Green using the proceeds of the stock manipulation deals and later sell the painting to “clean the money”’…The papers describe the art business as ‘the only market that is unregulated’”. “Green doesn’t seem to know that the price for laundering money is much higher than 5% which definitely isn’t worth the risk if it gets you indicted after being in business all of three months. Worse still, Green and his partners don’t seem to be the swiftest criminals. They boasted that the art market is unregulated but then created a scheme that seems to have had little to do with the art market itself.